Company President Carol Campbell shows off new CIC’s new 40-60 Hoist. When Chicopee Industrial Contractors (CIC) officially marked a quarter-century in business a few months back, it did so with an elaborate open house at its headquarters in Chicopee. This meant that a good number of those invited — especially a host of the company’s best customers — had to rely on their car’s navigation systems to get them to the ceremonies. That’s because, for starters, they’d almost certainly never been there before — and also because this business is not exactly easy to find. Indeed, North Chicopee Street is a dead-end road in the northwest corner of the city, not far from Route 391. Meanwhile, the company’s facility is a somewhat non-descript building, with its claim to fame being that it housed Hampden Brewing Co., maker of Hampden Ale, decades ago. Those customers, most all of them manufacturers — although there are some other sectors in the mix, including area municipalities — don’t come to CIC, because it comes to them, specializing, as it does, in rigging, heavy lifting, machinery moving, machine installation, millwrighting, machine repair, plant relocations, and more. Once they found the place, open-house attendees could see that the company boasts a large inventory of equipment, space to store machinery for some customers, a training room where employees hone both technical and soft skills (more on that later), and even a large picture of the property with the Hampden Brewery sign on the roof. Most of the guests probably won’t be back until there’s another round-number anniversary, said Carol Campbell, the company’s energetic president and CEO, who told BusinessWest that she’s marking her anniversary, in part, with steps and strategic planning to ensure that there are such occasions. “We’ve done some looking back at where we’ve been and what we’ve accomplished,” she said of anniversary celebrations that officially began in February. “But we’re really looking ahead to what we need to do as a company. We want to be here in another 25 years. There is much that goes into that phrase ‘better-equipped,’ including initiatives such as the company’s most recent acquisition, a 40/60 Hoist, as it’s called. The numbers reflect the fact that can handle loads of 40,000 to 60,000 pounds, and Hoist is both the name of the manufacturer and a description of what it does. The machinery was acquired to give CIC more flexibility and the ability to work more efficiently, said Campbell, adding that it’s a solid investment in the company’s future. As are other measures that fall into that category of being ‘better equipped,’ such as the many training programs carried out in a classroom carved out of space on the building’s second floor and other efforts to build and strengthen the CIC team. The new piece of wall art at Chicopee Industrial Contractors tells a compelling story. 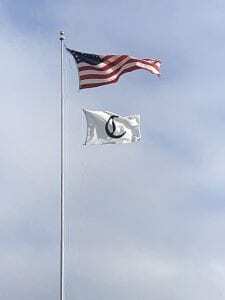 But while Campbell said the 25th anniversary was a chance for her to thank customers such as Lenox, Smith & Wesson, Olympic Manufacturing, and others, as well as that team she talked about in such glowing terms, that second constituency turned the tables and thanked her with a gift. 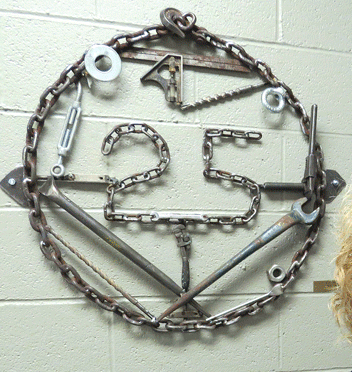 Now holding down a prominent piece of wall space at CIC headquarters, the artwork is symbolic in that those tools, and employees’ mastery of them, made ‘25’ possible. This is a success formula that Campbell won’t be changing — but she may add some new ingredients to ensure that higher numbers can be reached. As she talks about economic cycles, and especially downturns, both modest and severe, Campbell does so with tremendous recall and attention to detail. Most people who have a business within the construction sector or who have a customer base dominated by manufacturers have such ability, and for good reason. Those are sectors that are among the most vulnerable to recessions, and, as noted, CIC is tied to both. So she speaks from experience, and lots of it, when she says her business is what she calls a ‘lagger.’ That’s not a real word, but one nonetheless often used to describe a business that lags behind others when a recession hits. And that’s because there’s work to do soon after the economy turns south. For CIC, that work translates into handling assignments for companies that are downsizing — or worse, as in closing their doors. After work of this nature is done, then the recession hits for CIC. Which means that, while the phones stopped ringing at most businesses just a few hours after the planes struck the Twin Towers on 9/11, they didn’t really stop ringing at CIC until several months later. And it was the same later in the decade; while 2008, the height of the Great Recession, was the year of doom for most businesses, it was 2009 for CIC. But while the declines come later, they are still profound, said Campbell, adding that one of her goals as she looks at what’s ahead for CIC is to reduce the impact of such declines, or, in other words, make the ups and downs (or at the least the downs) less dramatic. This will be difficult, given the nature of the customer base and the general portfolio of products and services, but initiatives such as the new 40/60 Hoist will certainly help, she said. In the meantime, the company will look to make itself more of a force when the economy is doing relatively well. And this involves sticking to the playbook first drafted in 1992, the one that enabled that sculpture to take the shape it did, and making the team carrying out those plays even stronger. Elaborating, Campbell said one of her priorities moving forward is securing leadership for the future — at all levels. And while developing leadership abilities, the company is continually building upon the skills of its team members, one of the keys to its ongoing success, Campbell noted, adding that this was one of the matters she’s stressed to employees as the company has marked 25 years in business. One of the biggest challenges the company faces moving forward is securing enough talented workers to handle the various types of assignments CIC undertakes. Campbell said she has struggled for many years now to build the workforce when expansion was possible and needed, and like almost every owner of a manufacturing company or contractor, she’s concerned about the prospect of replacing those workers who will retire in the years to come. “It’s definitely been a challenge — for us, and for everyone,” she told BusinessWest, adding quickly that the generally frustrating search for talent is not exactly stifling the company’s growth efforts, and it’s certainly not keeping CIC from taking on work. But it is a concern moving forward, and one of the many matters to address as the company ponders what the next 25 can and should be like. As she posed for a few pictures around and on the 40/60 Hoist, Campbell looked ready to put it through its paces. But she’ll leave that to her talented, experienced crews. Instead, she’ll continue to do what she’s done from the start — manage, do some selling, build relationships, be active within the community and, most important, set a tone for the company she founded. That would be a tone of continuous improvement and performing well as a team — something her father, Vic Fusia, who coached the UMass Amherst football team in the ’60s, would certainly appreciate. Those attributes are responsible for the sculpture now gracing the hallway of the old brewery in Chicopee, and they’re the ones that will carry the company to new milestones — and moving experiences of all kinds. 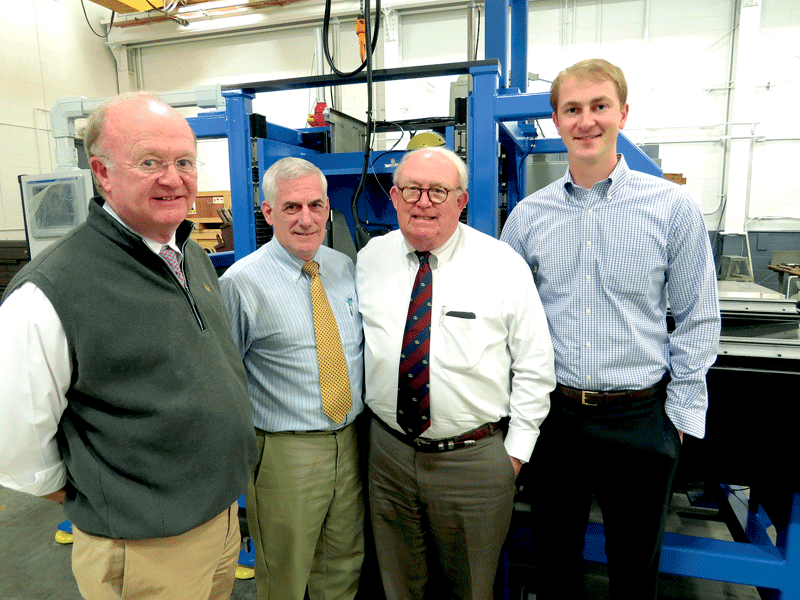 From left, Frank Mitchell, Chris Brucker, Jack Mitchell, and Mark Mitchell show off one of the company’s custom machines — one that will slice sapphire. 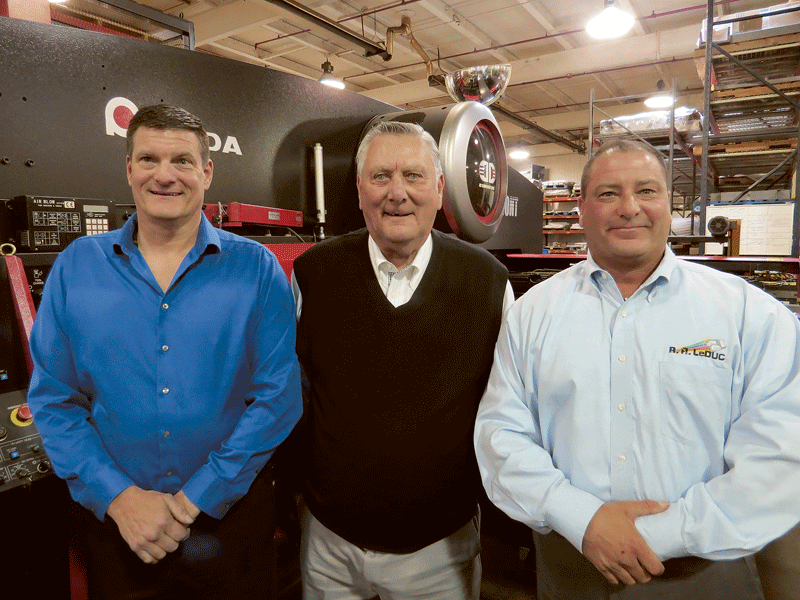 Since it was launched by John Mitchell in 1920, Mitchell Machine has grown and diversified — shifting from producing parts and tools for the Springfield Armory and Indian Motocycle to designing and manufacturing complex machines for the semiconductor industry. But since day one, the company has essentially been doing the same thing — producing solutions for its clients. And that’s exactly what the blue-painted piece of machinery is — a device that slices sapphire substrate into razor-thin wafers for use in the production of light-emitting diodes (LEDs) and other products. As they gathered for a photo in front of this piece of equipment, which was due to be shipped out to an unnamed customer within a matter of days, those at Mitchell Machine were careful to position themselves so that they were shielding anything that might be the slightest bit proprietary in nature. It has been this way — sort of, and in most respects — at this landmark Springfield company since it was started by Jack Mitchell’s grandfather, John Mitchell, in 1920. Back then, said Jack, one of the third-generation owners (his brother, Frank, is the other), this was mostly a parts manufacturer, supplying several companies but especially two huge customers steeped in history and lore and located just blocks away from the Hancock Street plant — the Springfield Armory and Indian Motocycle. 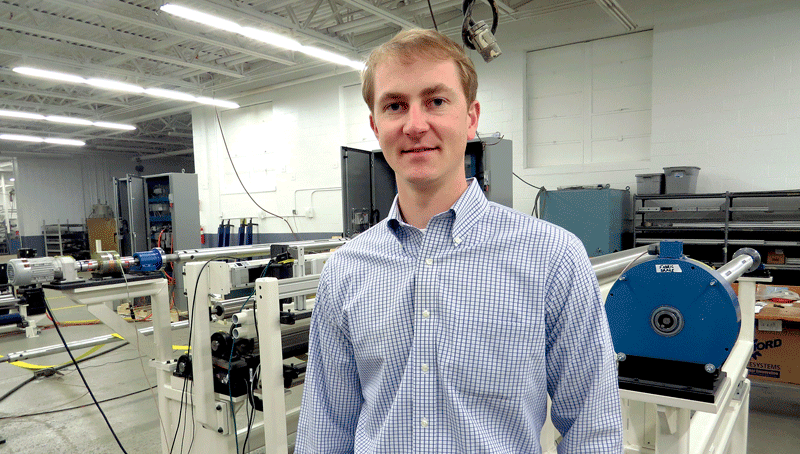 Chris Brucker says Mitchell Machine has a long track record of providing solutions to its clients. The second generation of ownership — John’s sons, Frank, John, and Richard — led the company through its first evolutionary process, into the tool and die business in the ’50s. Today, the company handles everything from production of special machinery — like the sapphire wafer slicer — to subcontract machining; from design and manufacturing of robotics equipment that can provide companies with cost-effective automation, to machine design and engineering services for companies that would prefer to outsource such important work. 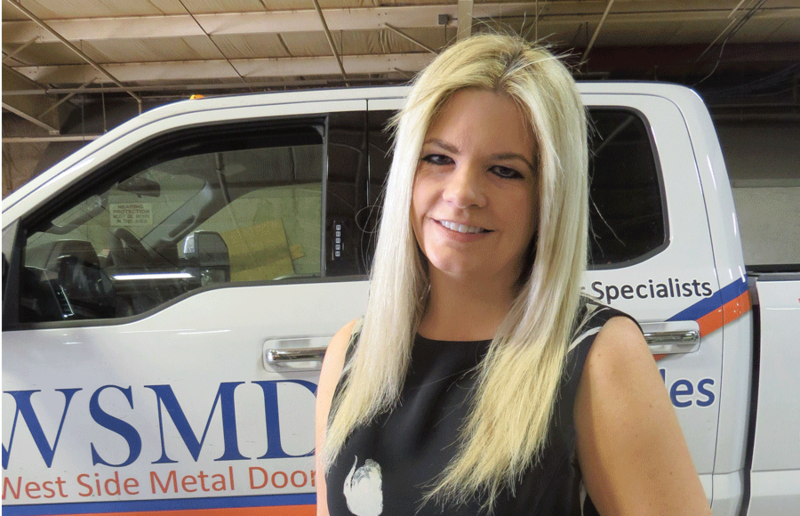 The common denominator when it comes to everything that goes on in (or out of) the plant today, and what transpired decades ago, is the fact that Mitchell has always been in the business of providing solutions to many different kinds of customers. “When people have problems in manufacturing — when they need to do something faster, they need automation, they need robotics — they require solutions, and we provide them,” he explained, adding that, as Baby Boomers retire and the task of replacing highly skilled workers becomes ever more daunting, manufacturers are increasingly looking at using technology to do (or help do) what people have traditionally done. Mitchell works with clients in a host of business sectors, including automotive, communications, machinery, electronics, plastics, printing, rubber, optics, and semiconductors. Many of these solutions are one truly one-of-a-kind in nature, meaning the company won’t even make two of them, he went on, adding that such undertakings make the business unique and the work quite intriguing. But it also brings challenges, especially the need to keep a steady flow of projects in the queue. 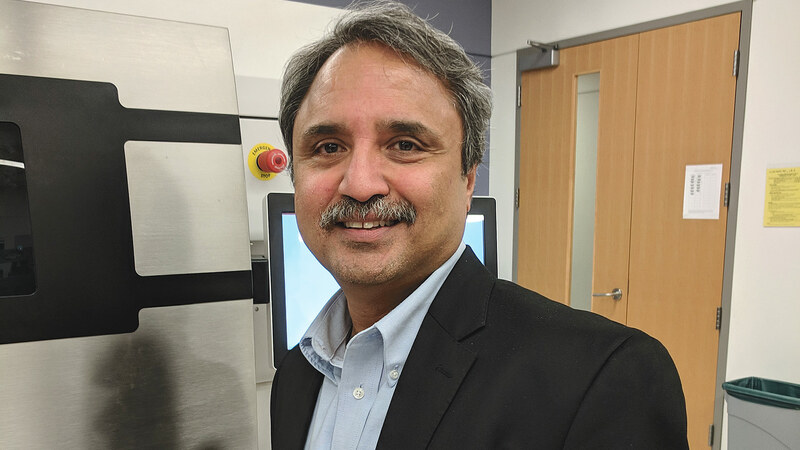 This need to continually bring in new work led Mitchell to become one of a handful of area companies to take part in Valley Venture Mentors’ first accelerator program for established manufacturers. 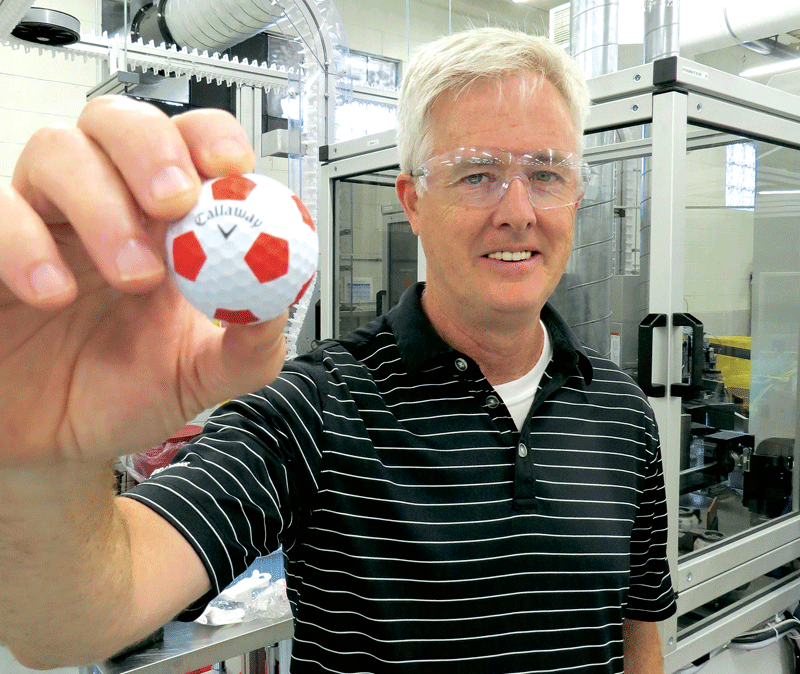 Mark Mitchell, Frank’s son, and thus a fourth-generation leader of the company, led Mitchell’s involvement in the intense, three-month accelerator program. He said it was helpful on many levels, but especially with marketing and raising the company’s profile, thus generating new clients. “There was a lot of insightful reflection on the company, how we produce, and how can market ourselves,” he noted, adding that, while the company made some direct contacts that might lead to additional business, many of the takeaways involved operations and becoming more visible. And one of the first orders of business will be a new and improved website. 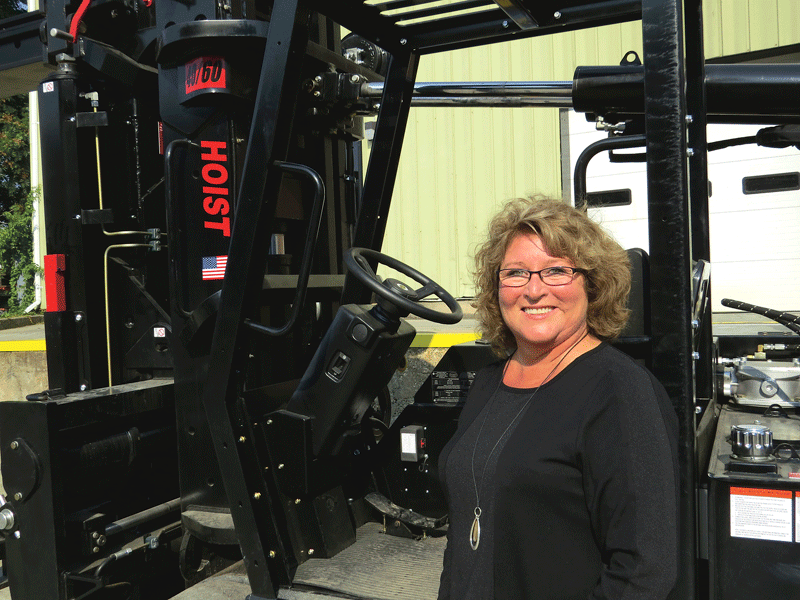 For this issue and its focus on manufacturing, BusinessWest takes an in-depth look at Mitchell Machine’s long history of providing solutions for customers, and how, as it approaches its centennial, it continues to find new ways to expand an already-impressive portfolio of projects. Jack Mitchell told BusinessWest that, when his grandfather arrived at his home in Springfield’s Hungry Hill section one afternoon in 1920, he had what amounted to good news and bad news for his wife. That job was as a toolmaker with Colt Industries in Hartford, he went on, adding that his grandfather’s story was typical of many machinists working for the Armory and other companies at the zenith of this region’s industrial age; individuals with an entrepreneurial bent who decided to take their assembled skills and go off on their own with a career turn (that’s an industry term) that would bring with it a whole host of risks, sacrifices, and unknowns. To make ends meet, Mitchell noted, his grandfather would work at shops like Van Norman Machine Tool and Bosch Machine during the day, and work at the company with his own name on it at night, logging 16- to 20-hour days, usually six days a week. What’s happened since that start, though, is far from typical. Indeed, the company has, as noted, reached fourth-generation involvement (a rarity in any sector, but especially manufacturing) and continues to find new and different ways to grow, evolve, and, yes, manufacture solutions for clients across a wide range of business sectors. Relaying some of the company’s rich history in Springfield, Mitchell noted that, during World War II, it made parts, gauges, and other equipment for essentially two clients — the Armory, which, by the war’s height, was employing more than 15,000 people in arms production, and Indian, which by then was producing motorcycles exclusively for the military. After the war, the company acquired new, larger equipment, and subsequently diversified into the manufacturing of complete, custom machines, and for companies across the country, not simply across town. Then, as now, it served a host of different sectors, many with a presence in this region, including the paper industry (many communities in the area had plants), tire making (those products were produced in both Chicopee and Springfield), and molded fiber, among others. “To this day, Michelin is still a customer — we’ve been serving the tire industry since the ’50s,” said Mitchell, adding that many customers in the portfolio have been with the company for decades. Mark Mitchell says the company’s participation in the manufacturing accelerator has provided new business leads and insight into how to raise Mitchell’s profile in the marketplace. The company’s next important step in diversification came in 1992 with the establishment of Mitchell Engineering, which took the company into the design-and-build realm when it came to custom machinery and robotics and to a new dimension in providing clients with solutions. Today, such work represents roughly 60% of the annual revenues, with the rest coming in the form of subcontract machining. As noted, Mitchell Engineering is in the business of providing solutions to problems, many of them workforce-related, he said, citing, as one example of the work it undertakes, an assignment involving Sanderson MacLeod, the Palmer-based manufacturer of twisted wire brushes. There are dozens, if not hundreds, of similar stories in the portfolio, he went on, adding that the machine to slice sapphire — which is ideal for use in both LED and non-LED applications due to its high temperature resistance, high strength, and good electrical insulation — certainly falls into this category. Many of the products and solutions that roll out the door command similar language, said Chris Brucker, an applications engineer for the company, adding that the solutions are generated through intense collaboration, or interface, with the client concerning the problem and the best means of solving it. As noted earlier, projects of this nature generally take at least six months from start to finish, and many require much more time. Thus, there is that heavy premium on constantly generating new work for the pipeline, said those we spoke with, adding that, as might be expected, it comes in two forms — additional work for existing clients, and attracting new clients. And recent efforts have been focused on both, said Jack Mitchell, adding that this is a relationship business, and once one has been established, the goal is to grow it. 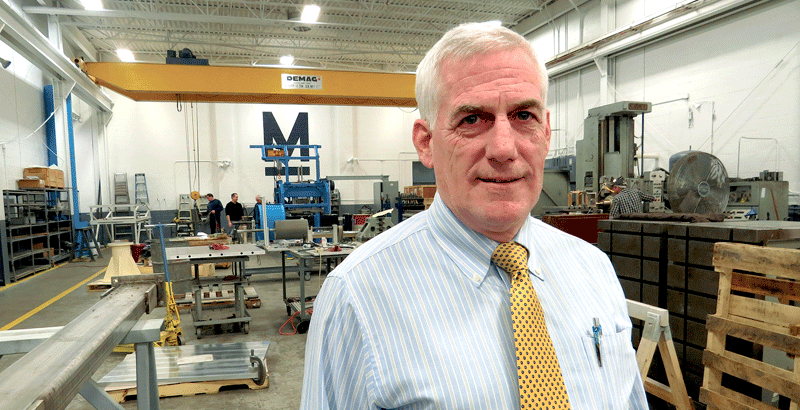 He said there are many examples where subcontracted machining has also led to work designing and manufacturing custom equipment or the promise of such work, including one case involving a medical-equipment manufacturer. 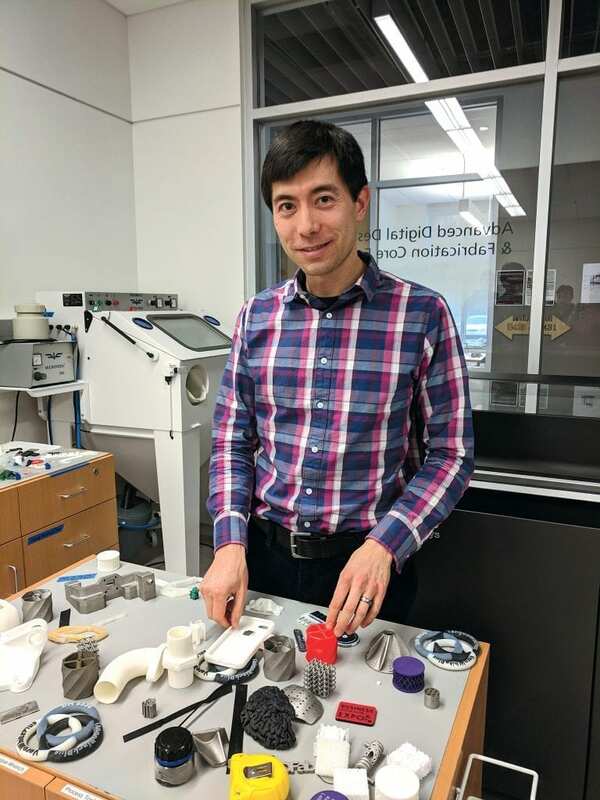 “It started with a small, complex part, and moved to a much more complicated assembly of parts, to creating a tool they could use,” he explained, adding that the next step could be work to design a production line for the company. 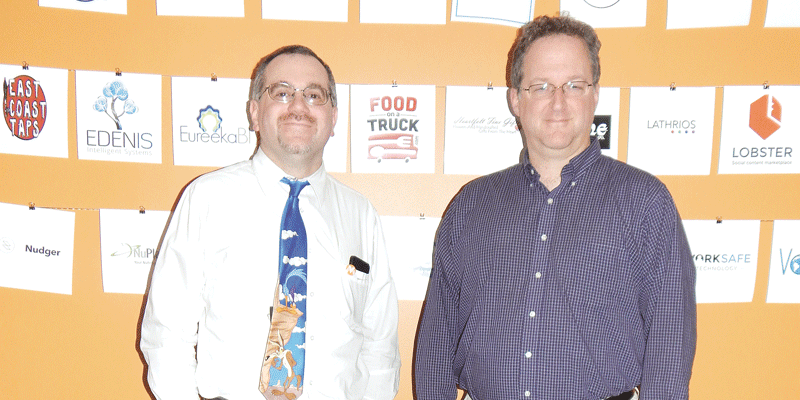 As for attracting new clients, word of mouth has always been and will always be the best form of marketing, said Mark Mitchell, and the company does take part in several large trade shows each year. Still, there are many who don’t know the Mitchell name and all that it stands for, and this nagging reality was perhaps the primary motivation behind participation in the manufacturing accelerator program, although connecting with new customers directly was also a goal. “We’ve quoted on a number of projects as a result of the program,” said Mark, adding that the program reaffirmed the notion that original equipment manufacturers, including many in this area, are not fully aware of the resources (such as Mitchell’s expertise) that are available to them. The small conference room at Mitchell Machine speaks to the company’s long history, and brings the past, present, and future together efficiently. Indeed, along with a few golf pictures (which reflect a passion for the game shared by several generations of the Mitchell family), the walls feature a few framed replicas of World War II-era posters proudly touting the contributions of defense contractors toward victory in Europe and the Pacific. “Your Work Means Victory — Build Another One” reads one poster depicting a shipbuilder. There’s also a 10-pound block of silicon sitting on a base in the middle of the table. It’s there as a nod to the fact that Mitchell has designed and built machinery that will shape that silicon in the production of microchips. As the company prepares to turn 100, it is still doing what it was doing when John Mitchell came home with that mix of good news and bad news — produce solutions. And along with those, it is making (and has always made) a proud name for itself. 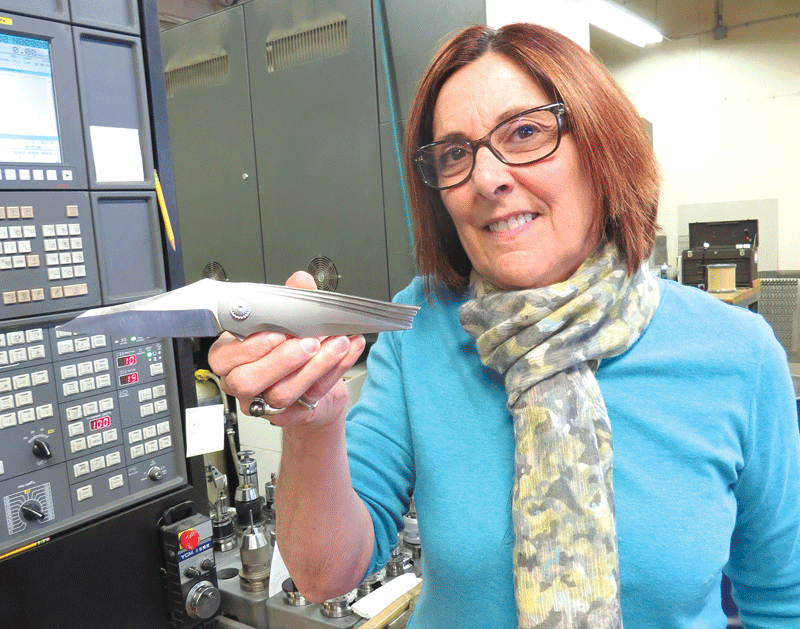 Marianne Halpern displays the Thunderbird, one of the knives now being produced by Three Rivers Mfg., a subsidiary of Halpern Titanium. It supplied custom parts — blades, handles, hinges, and other components — to knife makers across the country, she said of the venture that she and her husband, Les, started out of their home in Monson, more as a money-making hobby than anything else. 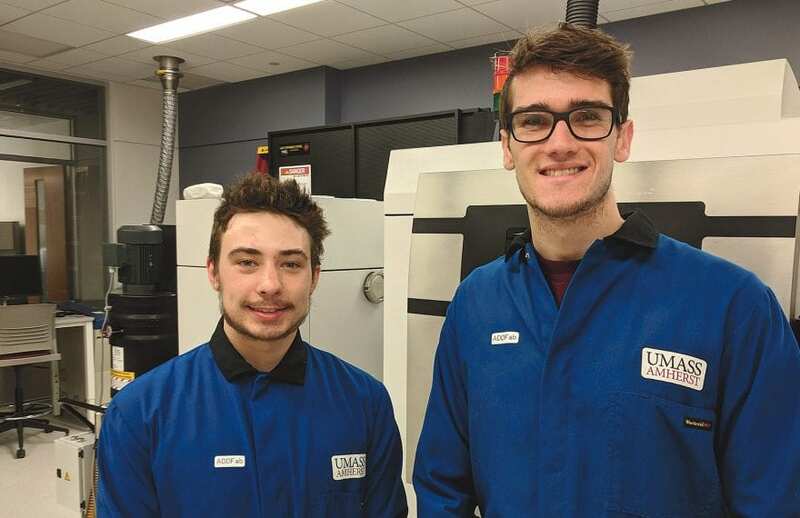 When it became much more than that — the two eventually left their day jobs to pursue this full-time — and did much more than supply knife parts, a name change was certainly in order, Halpern told BusinessWest. The search for something new and more accurate wasn’t exactly involved or scientific in nature, Halpern went on, adding that credit for what’s now in block letters on the business cards goes to the woman who handled that printing job. Indeed, this silver-colored, low-density, high-strength metal is practically synonymous with ‘cutting edge’ when it comes to its use in everything from artificial joints and dental implants to golf clubs; from eyeglass frames to Corvette engine parts. Meanwhile, the metal itself is not exactly easy to fabricate into any of the above, Halpern went on, adding that, in many ways, this name connotes precision and expertise to those who read it. Exactly how much the new name has helped the company is a matter of debate, but what isn’t is the fact that Halpern Titanium, now located in the Palmer Technology Center (the old Tambrands complex in Three Rivers) continues to grow and diversify itself into a major player within this industry. The company, which also specializes in other materials, including carbon fiber, fiberglass, and stainless steel, now makes parts for a number of knife makers, many based in Oregon due to very liberal knife laws there (quite of the opposite of what are on the books in the Bay State), but manufacturers of other projects as well. And within the past 18 months or so, it has taken its expertise to a new and different label by introducing its own brand of knives, produced by a subsidiary named Three Rivers Manufacturing (TRM). That venture has already produced several models, including the Nomad, the Class Action, the BT 1000, and the Thunderbird, which earned an enthusiast review from a trade publication called Knife News. 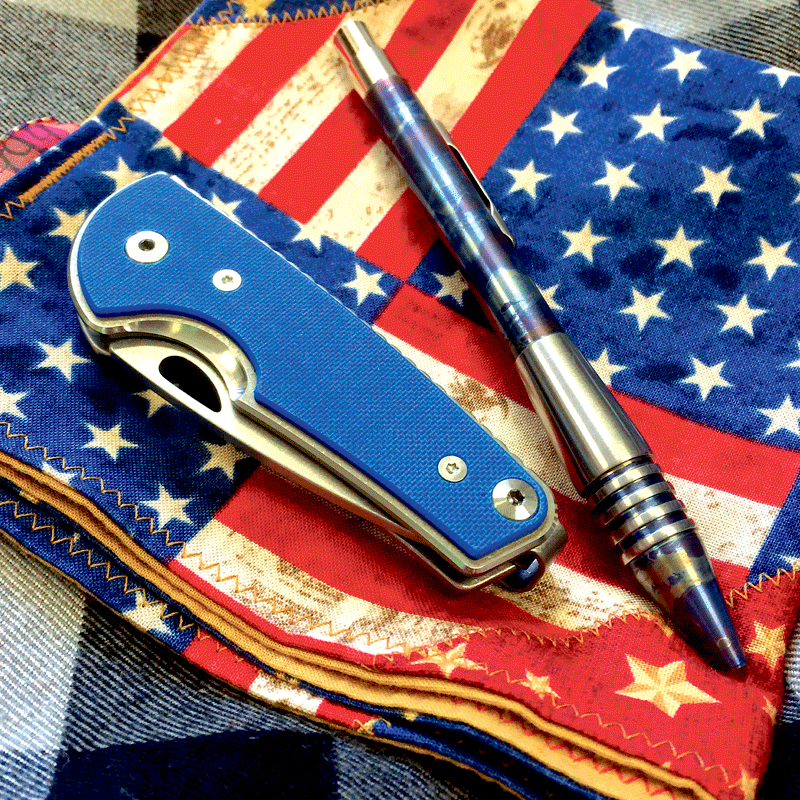 The Nomad Slipjoint, complete with titanium frames and royal blue G-10 handle, is one of several knives now bearing the Three Rivers Mfg. (TRM) name. TRM, currently selling direct to consumers from its website, hopes to roll out several new models in the years to come, said Halpern, adding quickly that the parent company’s main purpose in life is to help a host of major knife makers earn similar platitudes for their products. 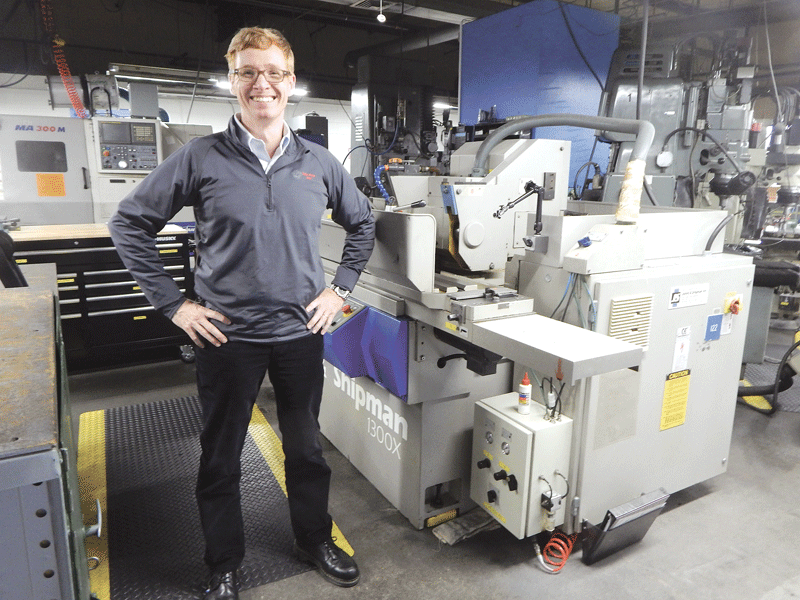 For this issue and its focus on manufacturing, BusinessWest takes an in-depth look at a company with a sharp — as in sharp — focus on controlled growth and further expansion of each of the many components within the business plan. The printer who handled the Halperns’ business cards had more to do than help come up with a new name. Her eventual assignment was to pack a ton of information on that small space, while putting it all in something approximating titanium’s color on a black background. In short, there’s a lot to read there. Beyond the typical name, address, phone, and e-mail, the card provides a quick education into the services provided and materials used — at least to those versed in this field and the language associated with it. Indeed, there are phrases like ‘dynamic waterjet cutting’ and ‘swiss turning,’ and listed materials including ‘titanium sheet bar and plate’ and the related ‘6AL/4V, CP Grades 1-4’ (an alloy of that metal), as well G-10 (fiberglass) and carbon fiber sheet. One could also note that free quotes are available and that this is a certified women-owned business. Like we said, there’s a lot to read. And it all translates into the fact that this company has come a long way from the Halperns’ basement in Monson. That’s where things started almost 20 years ago, said Marianne, noting that she was a teacher at Tantasqua Regional Senior High School and Les was a designer in the adaptive equipment department at the Monson Developmental Center when they started to fashion parts for knife makers on the side — and got really good at it. So good, as noted, that they started thinking about this as a career move. Instead, they’ve been looking both outward and inward with an eye on finding new ways to do what the company has essentially done from the very beginning — serve as a solution finder for many of the nation’s most prominent knife makers. “Companies come to us with a specific need they need to address,” she said, adding that solutions include everything from parts to whole-knife manufacturing and assembly (although not much of that) to assistance with designing new products for the market. When asked to list some of these customers for which solutions are provided, Halpern said those names are among the many things are kept confidential within this large, tight, and highly competitive business. To effectively convey what the company does, Halpern had to repeatedly stop in mid-sentence, get up from her chair, and find a knife with which she could show the company’s contribution rather than explain it. She picked up an elaborate multi-tool product assembled by one of those companies she couldn’t name to explain how it makes one small carbon-fiber piece that holds the tool bit in place. She picked up another knife to show off one of the many types of handles (a good number of them produced from G-10), and on it went. 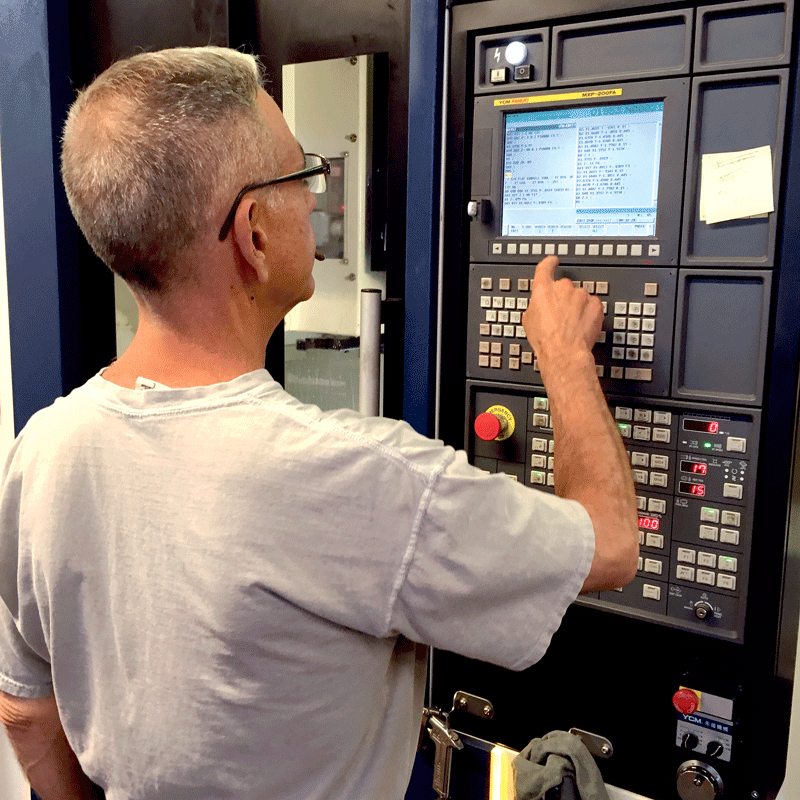 Les Halpern, seen here at the prototype CNC machining center, wears many hats for the company, including knife designer. There are many visible signs of growth at Halpern Titanium, starting with its facility in Palmer. The company started with roughly 3,000 square feet, a few machines, and the Halperns handling almost all the assigned duties. The footprint has expanded to 20,000 square feet, there are now 12 employees and 25 machines, and the Halperns, while they still work long hours, don’t have to do it all. A growing client list is another measure of success, she said, adding that the company has staked out a position as one of the clear leaders in this field. “There’s not a lot of competition out there — it’s not easy to do what we do,” she said, noting, again, the difficulty of working with titanium, G-10, and other materials. 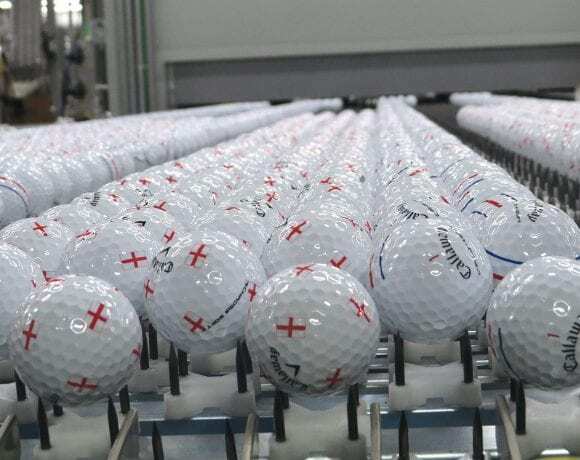 The new subsidiary, TRM, is still another sign of growth and progress, she said, adding that she and Les decided roughly 18 months ago to take their acquired expertise and put the company’s name on its work instead of someone else’s. Working in tandem with some noted custom knife designers, TRM brought a few products to the marketplace last year, she went on, including the Nomad, complete with an array of handle colors, such as ‘blaze orange,’ ‘cranberry,’ ‘forest green,’ and ‘battleship gray.’ The Thunderbird will be available online shortly. Results thus far have been generally positive, said Halpern, and the company is learning the new elements of business associated with this venture, especially the marketing side of the equation and its various social-media platforms. She and others will attempt to expand this following in June at the Blade Show in Atlanta, billed as the largest knife show in the country, sponsored by Blade magazine. Attendees will include custom knife makers, manufacturing operations, collectors, and many more constituencies. This means those representing both TRM and Halpern Titanium can multi-task, which is essentially what those at this corporation are now doing on a daily basis. Indeed, Halpern noted, with the many different kinds of operations, including production of its own brands, now taking place, the company must conduct what she called a “balancing act” to ensure that each has the ability to thrive and grow. “On the private label, we want to continue with those companies that want to add new products and grow with them,” she explained. “Meanwhile, we’re adding new customers selectively, making sure it’s a good fit, and we want to continue with our own models, introducing maybe a few new ones each year. Let’s see where that all takes us. Things like the Thunderbird, with its narrowing frame and deep milled-out grooves, and the Nomad, with its blaze-orange, cranberry, and battleship-gray handles. This company that was started in a basement continues to build upon its repertoire and its track record of excellence within the knife industry. As the name suggested by that printer a while back suggests, this company is on the cutting edge — in just about every aspect of that phrase. Sam Everett and Almeiro Serena say managers walk through the OMG plant several times a day to talk to employees and ensure there are no problems. 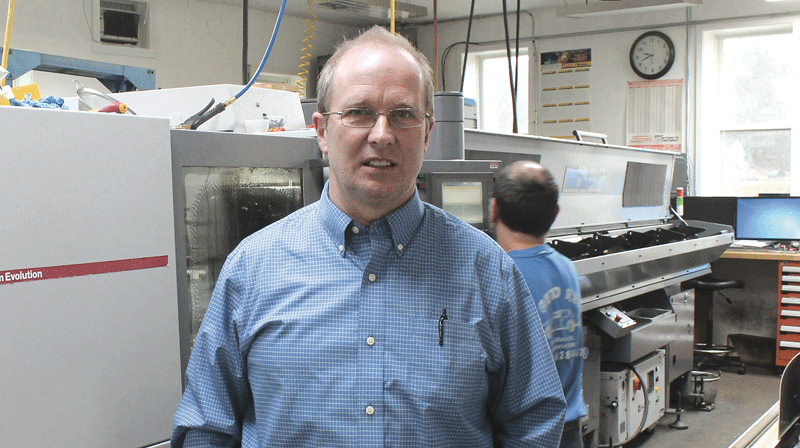 Hubert McGovern says people might wonder why a company would choose to manufacture screws in Agawam when they could be made far more inexpensively overseas. Indeed, this story is a unique and a distinctive saga of success. OMG Inc. has created a line of specialty systems and products that have set it apart from its competitors, established a global presence, and recorded sales that totaled $275 million in the past year. Its products include screws for commercial roofing, hidden-fastening systems for residential decking and trim, hot-melt adhesive systems, log home fasteners, and insulation adhesives and related products used in the commercial and residential construction business. The company’s growth and culture has been painstakingly crafted. Although safety is its top priority, the company is well-aware that its employees have played an enormous role in its success, and a great deal of time and energy are focused on ensuring they have opportunities to grow personally, financially, and professionally. He added that, since stress can hinder performance at work, OMG has put programs in place to alleviate it that address wellness, physical health, and financial matters. These include free exercise classes conducted in a large conference room or at a local gym during lunchtime and at the end of the day, periodic fitness and wellness challenges with awards, and a plethora of program offerings that range from swimming to yoga to TRX classes to accommodate people of different fitness levels. 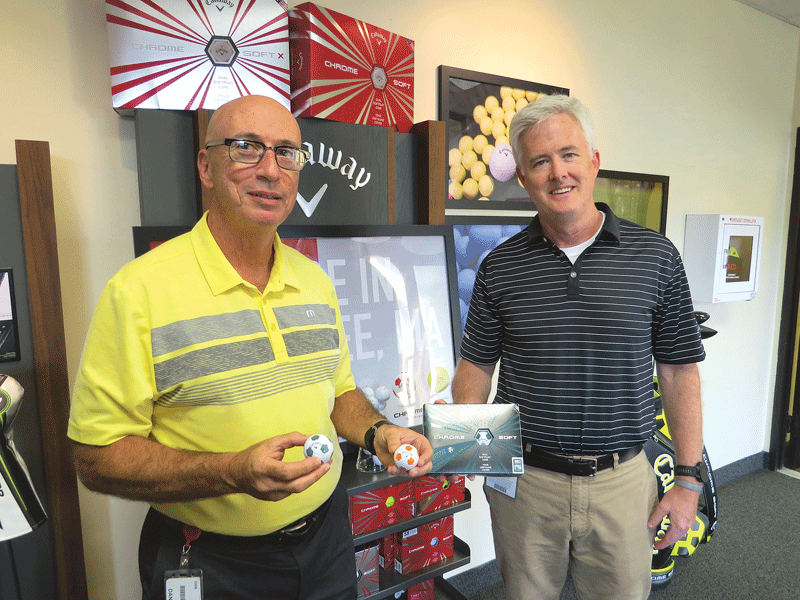 Each year, the company also stages an ongoing series of events ranging from holiday lunches to raffles for highly sought-after sports-related tickets. including Patriots games and even the World Series. Employees at OMG Roofing Products show off medals they won at a recent company fitness challenge. OMG also offers Dave Ramsey’s Smart Dollar financial-wellness program free to its employees. It consists of 17 videos focused on personal finance that can be viewed online. Each one is about a half-hour in length, and topics range from budgeting to investing. “Several people have been able to reduce their debt because of this program,” McGovern noted. Professional development is ongoing, takes place on site and off, and is another important element of the company’s success. 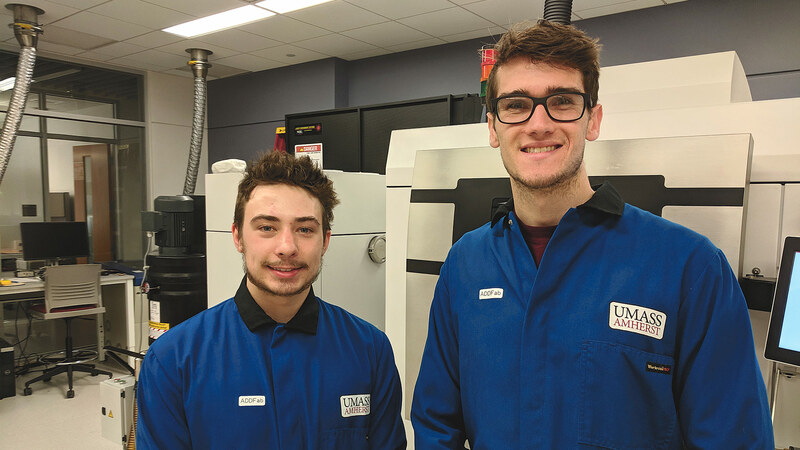 “We encourage people to push themselves, learn new skills, and take their own personal development to the next level by building on their strengths,” said Director of Communications Sam Everett, adding that the company also offers tuition reimbursement. An employee of the month is also recognized; people can nominate themselves or their peers, and the winner (sometimes there are several a month) receives a jacket and monetary award. 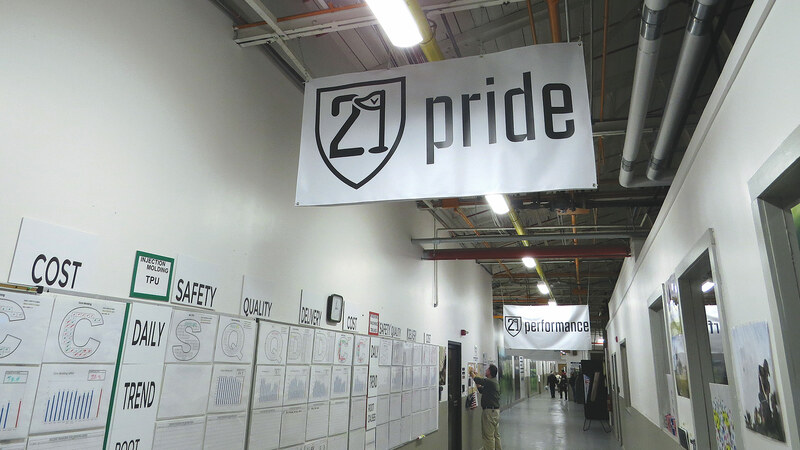 Open dialogue and communication at all levels of the organization are an important part of the company’s culture; there are daily gemba walks through the factory to keep managers abreast of what is taking place at the manufacturing level. “We’re always looking for ways to help people achieve their personal goals,” said Sarah Corrigan, director of Human Resources. 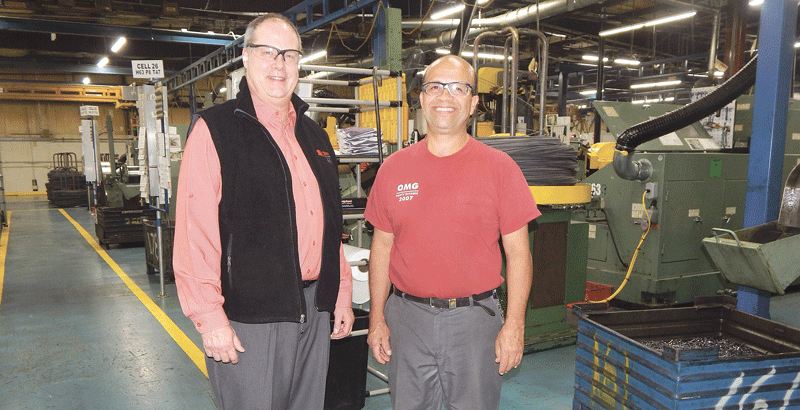 For this edition and its focus on manufacturing, BusinessWest looks at other measures that have helped OMG become a leader in the roofing and fastener industry, as well as what it has done to sustain that success. OMG was started in 1981 by Art and Esther Jacobsen, who named their business Olympic Fasteners Inc. They bought and sold screws for the commercial roofing industry, and in 1984, after experiencing great success, they moved the firm to Agawam and began manufacturing their own line of fasteners. In 2000, the company name was changed to OMG Inc., and since that time, it has continued to grow by expanding the product line as well as its geographic footprint. Today, the company employs more than 500 people, operates four manufacturing plants — in Agawam; Addison, Ill.; Arden, N.C.; and Rockford, Minn. — and has warehousing and distribution centers in Massachusetts, North Carolina, Illinois, Nevada, Canada, China, and Europe. 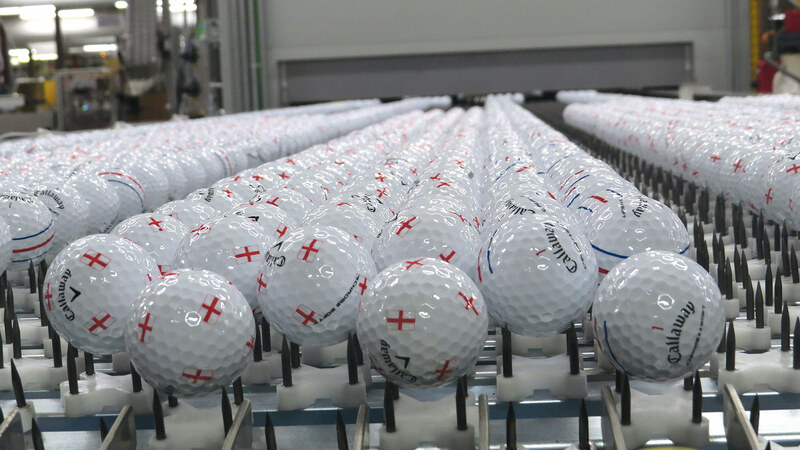 It also has a team of nearly 60 field-sales representative across the country and in China and Western Europe. However, the majority of employees work at the company’s headquarters in five buildings that contain 445,000 square feet, including 20,000 square feet of office and warehouse space in different areas of Agawam Industrial Park. Since its beginnings, the business has been split into two divisions. The first is roofing products; that division specializes in insulation and membrane-fastening systems, roof-insulation adhesives, retrofit roof drains, pipe supports, as well as engineered edge-metal systems, and innovative productivity tools for low-slope commercial roofing applications. Its second division is called FastenMaster, which makes a wide range of fastening systems and tools for residential applications. Much of the firm’s ability to continue to compete in a global market is due to its product-development teams, which have created unique offerings. They include RhinoBond, an advanced insulation and membrane attachment system based on induction technology that uses the same fastener and plate to secure both the insulation and waterproofing cover to a roof without penetrating the roofing material. “We took induction technology and turned it into a tool to install commercial roofs,” Everett said, explaining that screws and washer plates are used to hold down insulation on roofs. The roofing material is placed on top of the insulation, then an induction tool is used to heat up the plates, bonding them to the membrane cover layer and holding the roof in place. “Historically, insulation had to be screwed in place through the roof membrane or the waterproofing layer. But this product eliminates the need to poke holes in the roof, and because the attachment points are spread evenly across it, each fastener has to do less work to keep it in place when the wind blows,” Everett said, noting that the system is gaining popularity, and demand for it is growing. Another product created by the FastenMaster division is its Cortex Hidden Deck Fastening System, which is used for PVC trim and on decks made of composite materials, such as Trex, to hide fastener heads so they are virtually invisible. 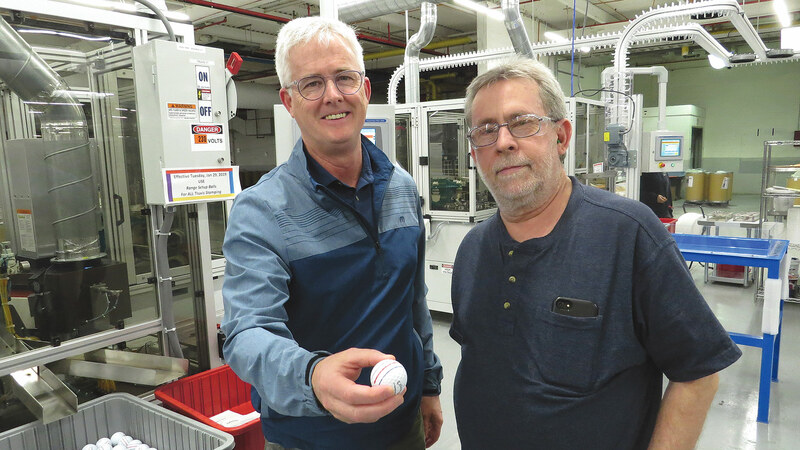 He told BusinessWest that OMG practices lean manufacturing, which is a method of continuous improvement to eliminate waste and improve processes. “It relies on participation by the entire organization,” he explained. To that end, small groups of employees are pulled from different departments on an ongoing basis to address problems and figure out how a process can be improved, which sets OMG apart from its competitors. “The philosophy behind lean manufacturing has to be driven over several years to see results; it’s a journey that never ends,” McGovern added, noting that company officials also meet with employees in groups of 40 or 50 several times a year to communicate goals and performance initiatives. The company is actively recruiting for 30 positions and plans to add an additional 20 jobs over the next several months; new positions will open in part due to a $15 million expansion underway in Agawam that will allow OMG to heat-treat its products in house instead of outsourcing the work. A building that was used for warehousing is being converted into an area where the heat-treating can take place. Everett said the warehouse has been moved into space the company rented in the industrial park. OMG owes its success to its culture and efforts to set the company apart from competitors. And it has done well; it is the largest roofing-fastener supplier for commercial roofs in the country, and more than 65% of all commercial, industrial, and institutional buildings in the U.S. have one or more of its products on their roof. And, of course, developing the people behind the scenes who are, after all, the driving force that has helped OMG secure its business in a rapidly changing world, and stay on top of things, as they say in the roofing business.